New price means this is the best value, but you have to check out the quality - this should be your new home! Situated on a quiet cul-de-sac, this beautiful 2 sty exudes charm & curb appeal galore! Entry foyer w/ rich hrwd floors leads you to sophisticated LR & elegant DR accented w/ crown molding. Expansive GR, lined w/ wndws, features a gas F/P, surround sound & dry bar. Whip up a culinary delight in center island kitchen equipped w/ Silestone counter tops, 42’ custom cabs w/ pull out drawers, SS appl & 2 large pantries. 3 windw bayed brkfst rm provides access to newly landscaped back yard w/ private patio. 4 large 2nd floor BR’s w/ WIC's, including vaulted mstr suite, loft & 3 full bths w/ Jack-n-Jill. LL w/ 9’ ceilings & rough in bth awaits your finishing touches. Freshly painted interior. MFL, zoned & energy effic HVAC & fin 2 car garg. Enjoy subd pond, gazebo & playground. 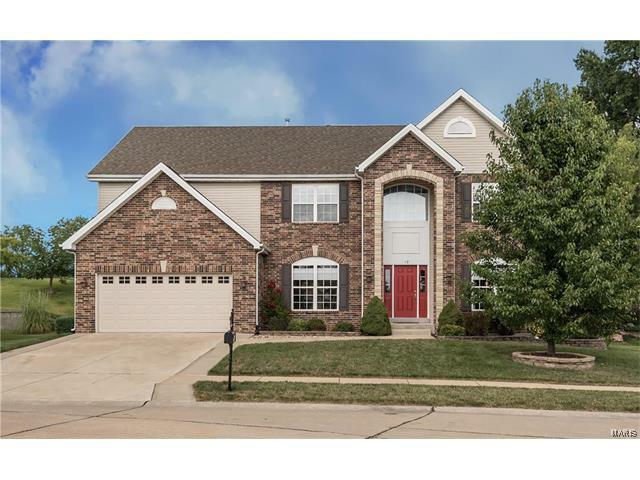 Wow location with great airport access, check out nearby Katie Trail and Creve Couer Lake! Over 3300 sf!